The pursuit of fitness and health has been a part of my life since I was a child. As I was growing up I participated in gymnastics, figure skating, and cross-country skiing, and just loved to be moving. I grew up in Northeastern Canada, so Functional Fitness (although I never really called it that) was a big part of everyday life. We heated our house with wood, so the year was patterned around preparing the next section of wood for each year. My dad saw to it that my sisters and I could handle a wheelbarrow and axe, and know our way around a woodpile. As I transitioned to college, my fitness pursuits had mostly become solitary activities such as running and swimming. I remember vividly the first time I attended a "Group Fitness Class". It was a double-step class in 1996, in which I promptly placed myself in the very back corner. The instructor's name was Steve, and he had the most amazing energy and kindness. I somehow stumbled through that class and never looked back. I became infected with the motivation and support of a group having fun and pushing each other on to their best selves! In 1998, during graduate school for Biochemistry, I decided to pursue becoming a certified Group Fitness Instructor through the Canadian Association of Fitness Professionals (CanFitPro) and was able to teach, which was a great break from the daily grind of school. While I was there, I also was able to participate in a Learn to Row program instructed by members of the Canadian Olympic Rowing Team, which was so inspiring. With this program, we trained indoors all winter, and come spring we took it to the water. Following my move to the US in 1999, I became certified with the American Council of Exercise (ACE) in 2005. After the birth of my daughter in 2004, I left my traditional day job, and teaching group classes became an amazing source of fun and enjoyment for both of us. One of her closest friends is one she sat alongside in the gym nursery! My love of movement and all the varied facets led me to certification in YogaFit in 2007 and Spinning in 2010. I also was a participant in CrossFit for 4 years, teaching Boot Camp patterned classes for new clients. I have found that my love of movement also extends to running, and the freedom of exploration it provides in any new or old place, as well as the discoveries I get to experience along the way. It was exciting to train for half marathons, and to have trained and completed one full marathon. I have been a part of the Group Fitness Industry for almost 2 decades and it has been such an immeasurable blessing to my life and to my family. My husband and I, our daughter, son, and chocolate lab Charlee live here in Saline. As most of us know, kids and dogs also love to move, and it's so much fun to move along with them. Most of our favorite family memories are of exploring new places on foot, bicycle, boat etc. My discovery of Workout1, Emily, her staff and the beautiful family of Boot-campers was a tremendous treasure to come upon. 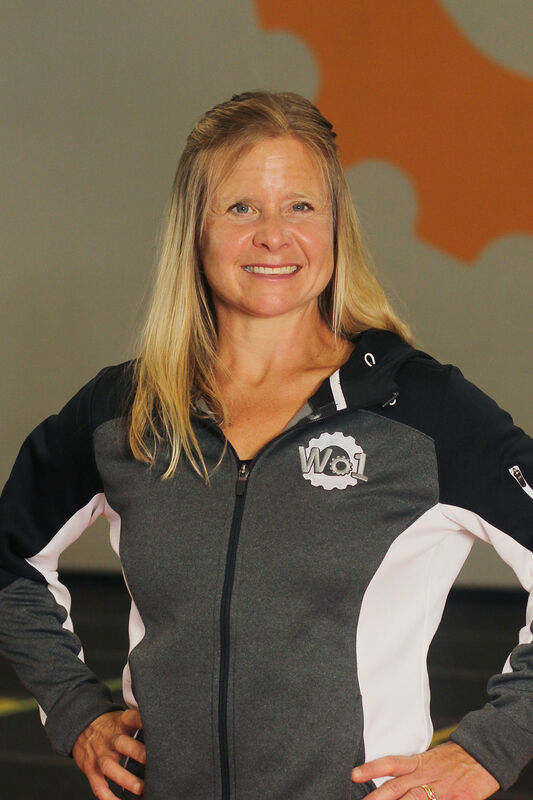 Her enthusiasm for fitness and well-being, her love of movement, efficient, functional workouts, and compassion for others is a tremendous model for me and a privilege to be a part of. It'�s exciting to be a part of executing and participating in this Workout1 family! For me exercise and group fitness is about the love of whole body wellness, freedom of movement, and the gifts you are able to give and unexpectedly receive by helping yourself and those around you discover our inner strength.